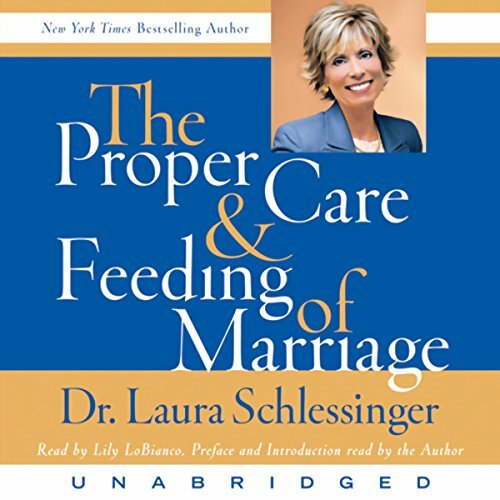 In this long-awaited follow-up to her groundbreaking best seller, Dr. Laura Schlessinger focuses on the need for men and women to understand and appreciate the uniqueness of masculinity and femininity; what the best ways to relate, care-take, and nurture each other are; and how to bring a marriage back from the brink of disaster. Dr. Laura asserts that in order to produce and sustain a wonderfully satisfying marriage, spouses must recognize and appreciate the polarity between masculine and feminine. Both husband and wife have power in the relationship, and each needs to realize this in order to ensure personal satisfaction. Using real-life examples from her call-in radio show, and giving real-life solutions, she examines the typical mistakes made by men and women in their relationships and shows how marriages can pull back from failure and divorce. reader has a nice voice, but thought dr. laura should have narrated. That is what I've said over and over while listening to this book. I'm 26 years old and a feminist liberal, raised by a single feminist liberal mom. I was skeptical to get this, but I was told I needed it. I have a 3 year old son and have been "engaged" for 4 years with no real plans for a wedding. After I got past the liberal and feminist bashing from this book, I can now see the light. I've never been taught how to have a relationship, I could never figure out why it didn't work. This has changed my life, and I think EVERYONE should read it, especially if you truly want life long happiness, this book will show you the way. I could write forever on much I've benefitted, but I will end it here, I have to get back to my wedding plans :) Thank you from the bottom of my heart. I'd give 10 stars if I could! I recommend this book to any man or female that is honestly interested in saving \ working on your marriage. Of course this is actually a great source of information for couples as well. Don't hesitate. Buy this and live by it. Would you listen to The Proper Care and Feeding of Marriage again? Why? Forget therapy or marriage counseling, just get this book. The overall key to making anyone's marriage become Great... is by doing your best to make your companion happy. Dr. Laura's book has healed my marriage and my way of thinking. I hated my job and was not happy in my marriage. Overnight I had a change in attitude and that changed everything. I have the same job and same wife but I am happy now. Highly reccomend to every married couple. Have you listened to any of Lily LoBianco, and Dr. Laura Schlessinger’s other performances before? How does this one compare? I have read almost all of Dr.L's books. I gave this book a "5" because now I finally "get it"!!! A must-read for all married (or soon to be) couples! In one day, I see vast improvement! I am proud of myself after 28 years! Give this book a try! You'll be glad you did! I just finished the audiobook of "The Proper Care and Feeding of Marriage." Wow, I can't begin to tell you all how this has already changed my perspective on my marriage. I have been a child in my marriage, not a WOMAN. I haven't given my MAN enough credit. I plan to use this book as a refresher in my mind when I am feeling taken advantage of or controlled. I know it is going to help. I recommend this book to all, good marriage or rocky, female or male, religious or not. This book shows great examples of what I can do to change what is inside of me and how I can change my own thinking. Finally, all I can say is DUH. It is all common sense but I have never heard these words this way before. Here comes the bride in Happily Ever After! This book could save you thouands of dollars and heartache. Well worth the listen. I love this lady, Dr. Laura is my hero!! This work is packed with Truth, Justice and the American Way. She understands men better then men understand men, this man included. She knows what needs to be in place for a marriage to not just exist but thrive. This is most defiantly a 5 star work. The reason I gave it 4 stars is because Dr. Laura did not narrate it. She has a specific personality that when fused with the words makes the work uniquely hers. Without her narration it is not the same. I kept having to remind myself that this is suppose to be Dr. Laura speaking. Before you go through a divorce listen to this book. Should be a requirement for every marriage!!! Where does The Proper Care and Feeding of Marriage rank among all the audiobooks you’ve listened to so far? I have more than 1000 books in my library and this is the best book in it!! I have listened to it more than 5 times and every time I cry. I love my husband more than the air I breathe but sometimes I don't show it. This book ripped me to the core!! I agree with EVERY WORD but sometimes I get so self-absorbed that I neglect the most important thing/PERSON in my life. This book helps me put everything in prospective and remember why I fell in love with my Man! He is a MAN and loves me! I now send this book to all my friends so they can have the marriage we all dream of!! Thank you Dr. Laura for reminding me who I am and WANT to be, MY HUSBANDS WIFE (GIRLFRIEND)!! What was one of the most memorable moments of The Proper Care and Feeding of Marriage? The entire book is life changing!!! What insight do you think you’ll apply from The Proper Care and Feeding of Marriage?